A warm fire is burning. I usually decorate my house a little, but this year I did a little more. My Mother passed away two years ago and I have inherited 1/3 of a huge collection of wonderful things. This year I put a small fraction of them out. Like this Santa. He greets you as you come in the door. This 6' tall Nutcracker stands guard at the bottom of the stairs. ... where Santa looks up at the heavens too. This woodsy Santa in his fur coat and fur boots is carrying a fresh cut Christmas Tree and a whole sack full of toys. ... and lots of cakes and sweets to eat! ... it makes the whole house glow. 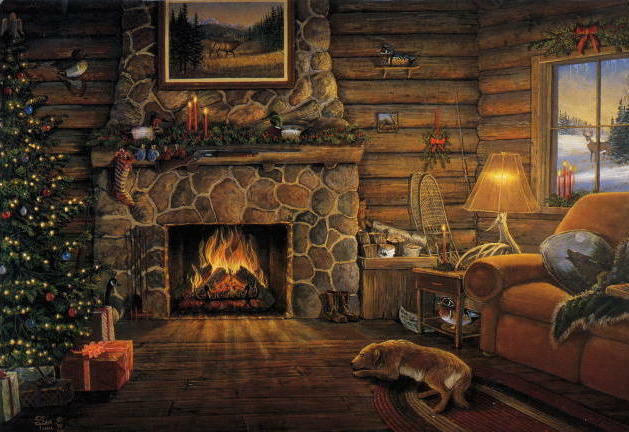 ... while the house glows warm inside. Looking in... Timber looks out the dining room window. And finally, a look in from the front porch.